Private rental sector (PRS) landlords will be risking a fine of £3000 for breaking the law by letting rental property to illegal immigrants without doing proper background checks and comprehensive tenant referencing. The proposal is currently undergoing a seven week consultation process and set to become part of the forthcoming Immigration Bill, launched by Immigration Minister, Mark Harper. Under the proposed new legislation, illegal immigrants will not be entitled to free NHS treatment and will be prohibited from renting property in the UK. The proposals have been greeted with a very mixed reception by private landlords and Landlord Associations. 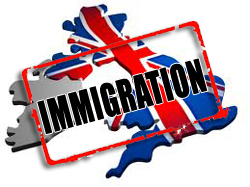 However, the Residential Landlords Association (RLA) said that 82% of private sector landlords do not support the proposals to compel them to carry out immigration checks. The RLA reckon that the proposal will penalise those legally allowed to stay in the country as rents will rise because letting agents will increase fees to cover the costs of further background checks on tenants”. David Lawrence, a private sector landlord from Salford spoke to MyPropertyPowerTeam about the new immigration vetting proposals stating “It is unfair that private sector landlords have to become unpaid agents for the UK Border Agency, we are already having to comply with hundreds of legal requirements in order to run an honest property rental business, without further encroachment on our time and without access to the proper resources that we are going to need in order to comply with this new proposal, its ridiculous and hasn’t been thought through at all”. This was written by Mike Clarke. Posted on at 11:35 am. Filed under Landlord News, Referencing. Tagged agents, Alan Ward, background checks, civil penalty scheme, consultation, employers, fines, illegal immigrants, immigrant, immigrants, immigration, immigration bill, immigration minister, law, Legal 4 Landlords, legislation, mark harper, migrant workers, national landlords association, new legislation, new tenants, NLA, penalties, private rental sector, private sector landlords, process, property, proposals, proposed, prs, rent, renting property, residential landlords association, Richard Lambert, RLA, ruling, tenant referencing, UK, UK Border Agency, unpaid. Bookmark the permalink. Follow comments here with the RSS feed. Both comments and trackbacks are currently closed.